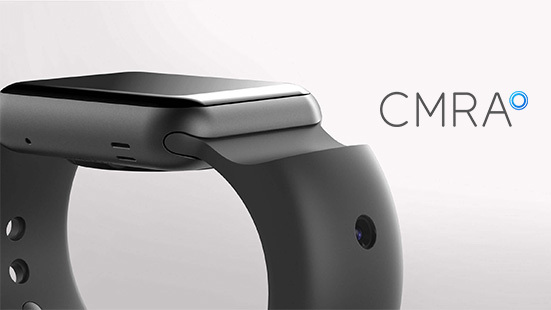 If you love the idea of the Apple Watch, but can’t understand why Apple decided to not include a camera on the hardware, then you may want to take notice of the new Glide CMRA band. As part of its attempt to bring yet another Apple Watch band to market, Glide has introduced an innovative band which is embedded with a 2-megapixel front-facing camera, as well as an 8-megapixel outward-facing proposition. One of the impressive things about this Glide offering is that it manages to introduce two cameras into the fold without having a ton of bulk or additional weight and size added to the band itself. The band looks very similar to any other silicon Apple Watch band, save for the fact that it has two visible camera apertures as well as a button built into the accessory to activate those cameras. The integrated button does an excellent job of snapping an image when necessary, and is also equipped with a double-tap function that allows the user to switch seamlessly between the two cameras. The band is also integrated with the iOS Photos app on a system level, meaning that captured images are instantly stored and available to view without having to jump through any additional hoops. That all sounds impressive and very useful, but it’s really the ability to record video and actually invoke conference-style video calls that shows the true power of CMRA. When used with Glide’s video chat iPhone app, the new CMRA band has the ability to let users talk in real-time whilst on the move, or even send photos or video messages back and forth. 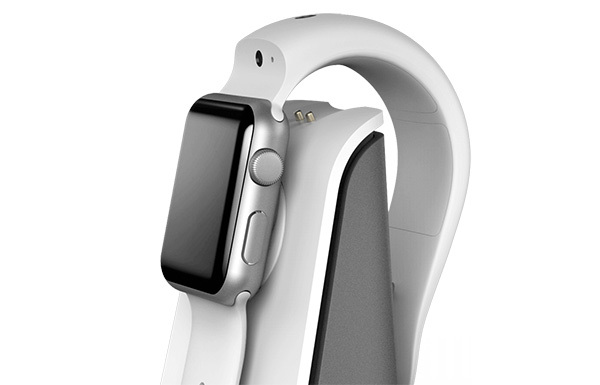 The band will ship with a custom dual-charging dock that works to charge both the Apple Watch battery and integrated CMRA band battery at the same time. The hardware is due to ship in Spring 2017, but the company is looking to accept pre-orders for the accessory months ahead of launch in order to not only get some orders on the books, but to also see if there is a strong consumer demand for what Glide is trying to achieve with the CMRA. Interested individuals can pre-order the band right now for an early-bird price of $149.00. Which smartwatch on the market has 2 cameras (or one) and support video calling and for which you don’t have buy a wrist band “adapter” ? This has espionage written all over it. But it’s gonna kill the battery real fast. Some companies don’t allow cameras. I know many people who wear an Apple Watch because other watches aren’t allowed. I’d rather have it adaptable. 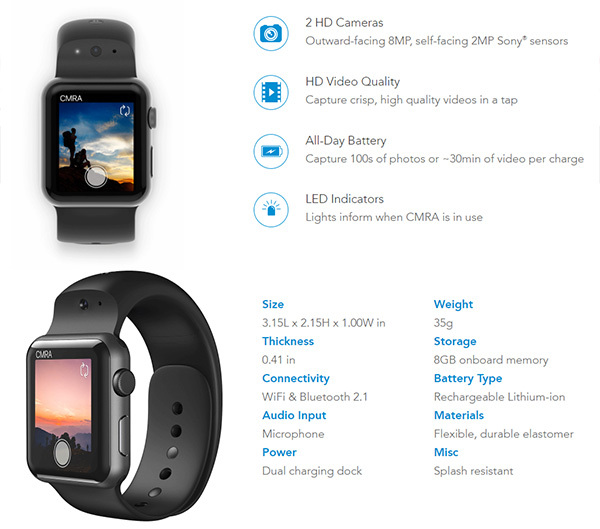 Mmm…Apple will soon make their own and better camera capable Watch. It has a battery of its own. The 2013 Samsung Gear had camera, but just for video recording and photos, because bascially video calling on your watch is a dumb idea, the screen is too small and therefore pointless. I know right! Wtf is the hold up? !